It has been described as the most exhilarating experience on earth, stepping off a bridge into a vast expanse of nothingness; whether it feels as exhilarating as you stand there waiting to jump is another question. However, thrill seekers continue to flock to the Victoria Falls Border Bridge to have that experience of a life time and despite their fears and anxiety still continue to jump. As with any sport or pastime it does come with dangers, safety is reliant on well maintained equipment and adherence to procedures. The incredible accident that happened here on New Year’s Eve is testament to what can go wrong. Bungee jumps at the falls were suspended for two days after the incident in order for a full investigation to be carried out to try and discover why the bungee cord failed and allowed thrill seeker Erin Langworthy an Australian tourist to plummet the final 20ft of the drop into the river below. She escaped the drop with a broken collar bone, cuts and severe bruising. After the investigation into the incident the tourism minister made the jump himself to show that it was safe. 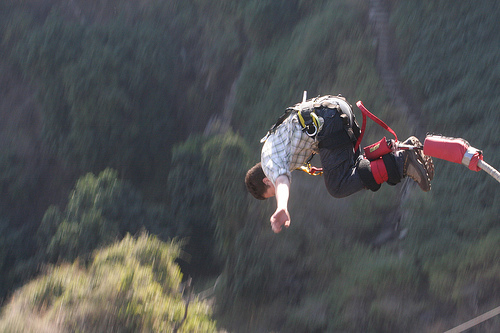 The bungee drop is a huge 111 metres, and if you arrive in the rainy season your jump may be delayed because of the rain. Try and smile as you plummet earthwards and keep a firm hold of your tongue as you will be filmed/recorded and many photographs taken in case you choose to buy the recording or the prints as a memento of your bungee experience. 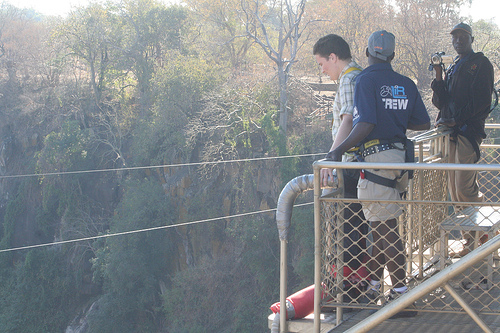 Registration for the jump takes place on the Zambian side of the bridge, there is no special clothing required in fact, the only advice given is that you should remove all jewellery and accessories before making the jump. Those who are registered to jump are checked and weighed before they are asked to sign an indemnity form. Jumpers will have their weight written on the back of their hand to ensure that the cord is set at the correct length and tension. All those who jump must be over 14 years of age, and if under 18 have written permission from a parent or guardian to make the jump, and the permission giver must be in attendance on the day. Any medical problems must be disclosed during the registration process. There is no maximum age limit for jumpers; providing those that wish to make the jump pass the medical screening and pass the examination of the senior crew, the jump is theirs to make. All jumpers need to have a body weight of no less than 40kg (88lbs) and no greater than 140kg (308lbs) during low water times and 130kg (286lbs) during high water times. Those with pre-existing medical conditions like high blood pressure, heart conditions, epilepsy, neurological disorders, vertigo and back or shoulder injuries are advised not to jump; the only other advice is that female jumpers should wear shorts or trousers to protect their modesty when jumping. This entry was posted in Africa, Air Sports, Bungee Jumping, Travel and tagged Africa, Bungee Jumping, Victoria Falls, Zambia. Bookmark the permalink.